"Dee Christopher has taken the Brainwave effect to new heights with his new effect. I looked for the R/S... There was nothing. He fooled the hell out of me." INSANEwave is Dee Christopher's evolution of the BrainWave effect. The classic effect is that a named card is the only card in the deck with a different coloured or contrasting back design. I wanted to take the effect further, I loved the image of spreading a deck and having multiple cards with different backs, I began work on forging a solution with several thoughts in mind. I wanted this deck to be normal, so that a spectator could handle it or I could do other ESP or card effects with it. 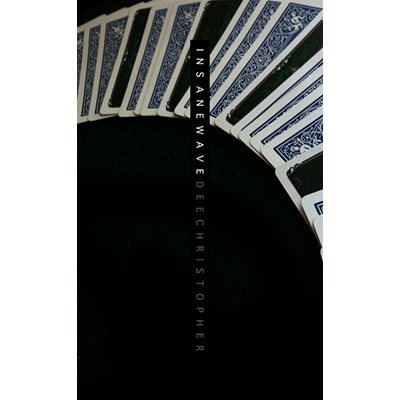 I wanted the method to work with playing cards, ESP cards or any other type of photo or card. I didn't want to use rough and smooth, I wanted a set up that was easy and FAST. I wanted it to work EVERY time. A spectator is handed a deck of ESP cards and shown the 5 sets of 5 symbols. They are asked to shuffle and just name one symbol. Let's say they named a circle. The performer then spreads the deck across the table or in his hands face down. 5 cards are seen to have red backs in the blue deck. These are revealed to be the 5 circle cards. Dee Also details how to create a living/dead style effect using this method and talks about doing this with playing cards also. Don't miss out on this very deceptive and insanely powerful effect. Step your act up a notch with INSANEwave.